On a rooftop, the Turtles meet up with Pigeon Pete to receive some intel on a Kraang operation. In exchange for bread, Pete tells them that he saw a massive Kraang gathering, but he can’t remember if it was at the docks, the playground, the oil refinery or the train station. Leo splits the team up and sends them to scout each location, though they all have reservations about being outnumbered if they’re the one who winds up at the right place. Surprisingly, all the locations turn out to be Kraang bases with the exception of the one Leo went to (the refinery). The other Turtles get captured and Leo blames himself. With April and Casey on a school fieldtrip, Leo has no allies and goes rummaging through the lair for a weapon of some kind. Splinter tells him that as a leader, he doesn’t need weapons; what he needs is a team. Leo thinks about who he can call on in this most desperate hour. Sadly, the only allies he can scrounge up are Pigeon Pete, Kirby O’Neil and Ice Cream Kitty. They trace the tPhone signal to the Kraang base and put Leo’s plan into motion. Pete distracts the guards while Kirby uses his tech know-how to crack the code on the entrance. Leo infiltrates the base and uses Ice Cream Kitty’s gooeyness to short out the control panel keeping his brothers behind bars. Pete then pops up behind Leo, hoping he has more bread. This leads the Kraang straight to them and the Turtles have to fight their way to the wormhole generator that the evil aliens were building. The generator is connected to similar devices at all the other locations, but the only way to put them all offline is to cut four conduit cables simultaneously. 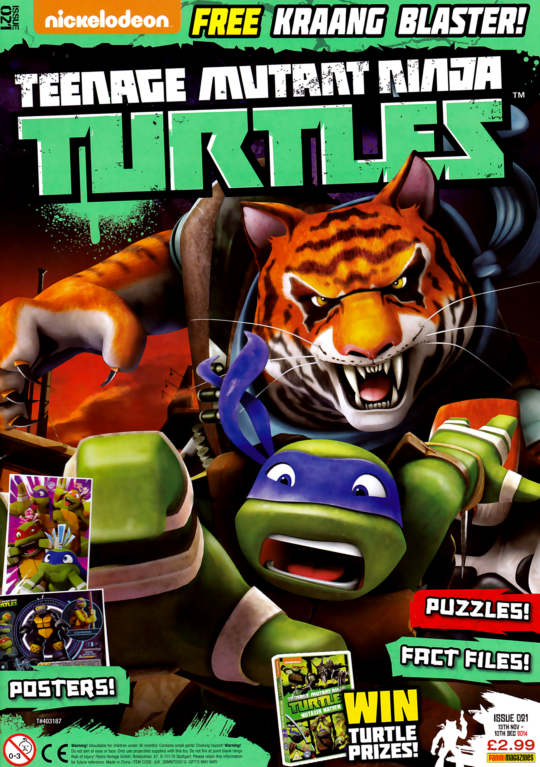 Using teamwork, the Turtles cut the cables and then escape before the facility explodes. Later, Leo thanks his “B-Team” for all their help. Kirby decides to go home where its safe, Pete flies away in his never-ending search for bread and Ice Cream Kitty goes to sleep in her cooler. Mikey tries to deliver a stirring speech about the power of inner strength, only to accidentally mention bread which gets him tackled by Pete. 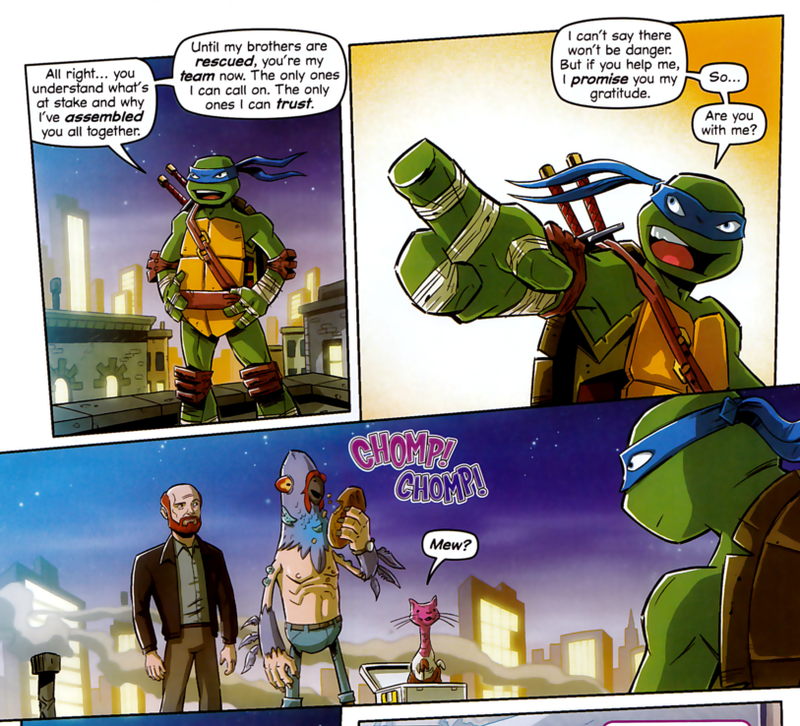 *This story is continued from TMNT Magazine (Panini) #20. 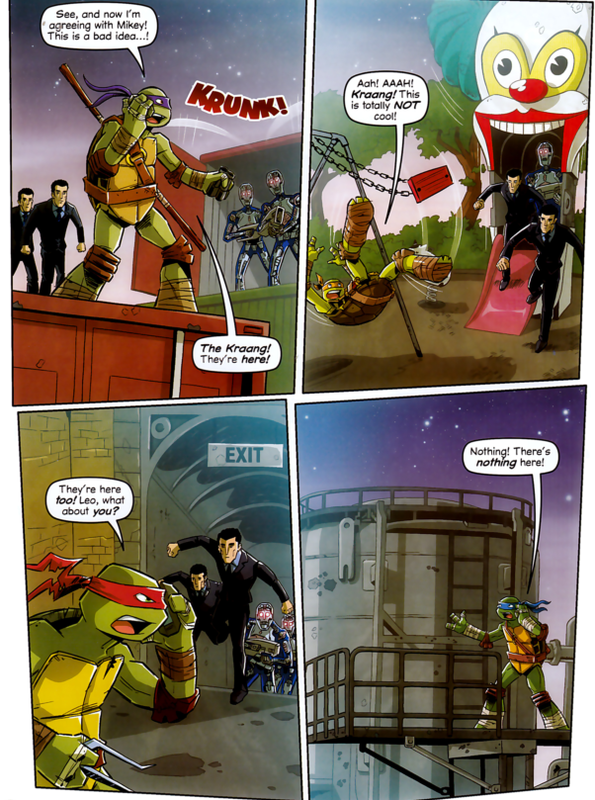 The story continues in TMNT Magazine (Panini) #22. 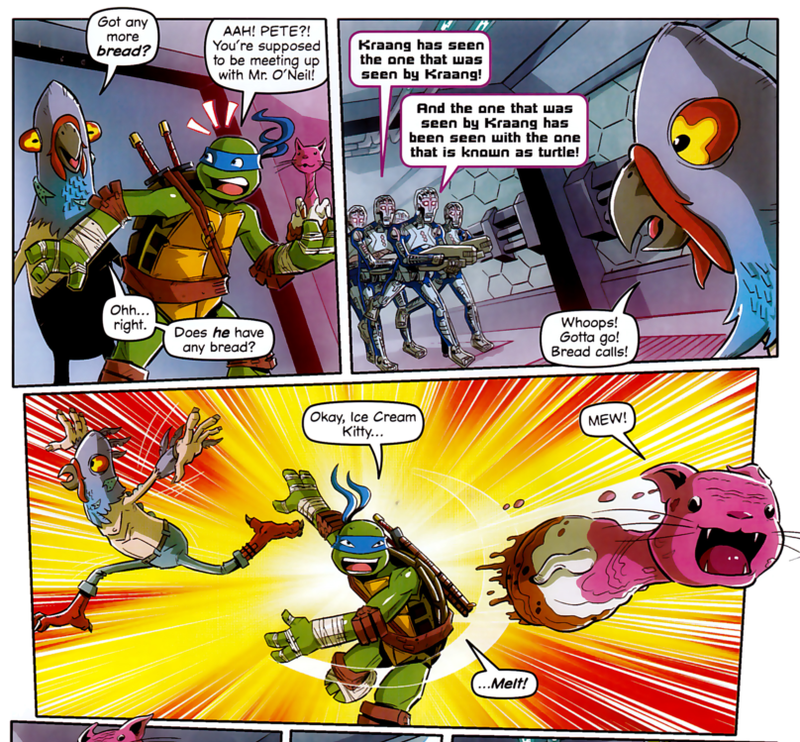 *Leo mentions that Pete has brought them reliable intel on the Kraang before. He did so in his first appearance in the season 1 episode “The Gauntlet”. *Since Kirby O’Neil is normal and New York hasn't been overrun yet, this story has to take place between the season 2 episodes “The Lonely Mutation of Baxter Stockman” and “The Invasion, Part 1”. I love stories like this; the “substitute” team of heroes cobbled together from the odds-and-ends characters circling the bottom of the barrel. It’s a formulaic plot, sure, but one that doesn’t get trotted out as much as other formulaic plots (“the shrinking episode”), so I’m not so sick of it. And it almost always makes for good comedy. Transformers Animated did a great one, as I recall. Anyhow, this is another of those stories that would have benefitted from being longer, but the nature of Panini’s TMNT Magazine has to cut it down to just 12 pages. As such, each member of the “B-Team” only gets to perform one vital service in the rescue of the “A-Team” before promptly disbanding. Writer Landry Walker puts together a very motley assortment of familiar faces, but the fun is seeing how he finds a niche for them to fill. It’s sort of like a Rube Goldberg device that you have to assemble yourself; someone throws a bunch of random items in front of you and tells you to figure out how to string them into a functional soil-tiller or something. So Pete distracts the guards not just because he’s weird, but because they recognize him as one of their escaped experiments. Kirby is the only one smart enough to operate Don’s decoding equipment and his familiarity with Kraang prisons doesn’t hurt, either. And Ice Cream Kitty’s very specific temperature and fluid viscosity is exactly right to gunk up the control panel. It was a fun script and one I’d liked to have seen fill a longer comic.